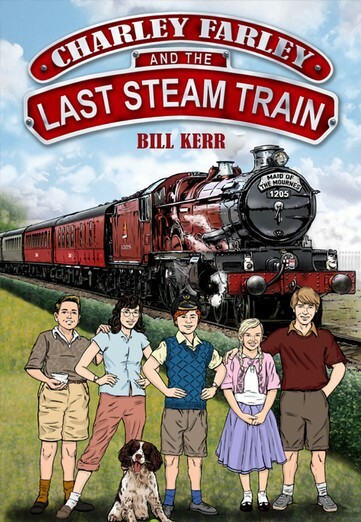 When Charley and his friends climb aboard their favourite steam train they suddenly find themsevlves at the centre of a seemingly unsolvable mystery. The children become entangled in a web of danger and deceit, where life or death, for each of them, hangs literally by a thread! Our five brave yet foolhardy heroes cling together on this rollercoaster journey of joy, heartache, tears and laughter. They even try to solve the riddle of the strange old... Shush... Listen... Listen! Did you hear the steamer's whistle just then? Did you hear her calling out your name? Come on, climb aboard! Find yourself a 1st class seat as we travel through the time tunnel and back to the past; back to an exciting era when giant steam trains ruled the rails. Hold on tight and enjoy the journey... the adventure of a lifetime starts right here! Bill Kerr was born in Strandtown, a suburb of East Belfast. His family lived in a little two-bedroomed house in Dundela Crescent, adjacent to Dundela Avenue, only yards from the first former childhood home of Bill's literary hero, Clive Staples Lewis. The Kerr family moved to the outskirts of Dundonald village when Bill was only two years old. Their new family home was situated barely half a mile from the old railway network depicted in his novel. Bill's childhood days were spent attending the local village primary school, also mentioned in his book. At the age of eleven he transferred to Regent House Grammar School, in Newtownards. This growing market town, situated on the most northerly tip of the Strangford lough shoreline, was to be his next home, when he married and moved from Dundonald in the summer of '78. He still lives on the outskirts of the town, along with his wife Jennifer, daughter Kathryn, and son Ryan. Bill describes himself as a 'Stumbling Christian', relying entirely on his faith to guide him in every aspect of his earthly life. He also has a deep love for children, having been, among other things, a youth leader and soccer coach for over thirty years. This is his first children's novel. To purchase a copy, click here to visit the book's official website. To purchase your copy, click here to visit the book's official website.